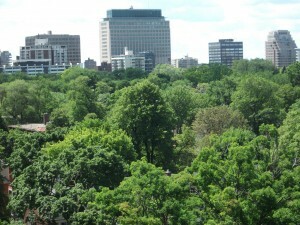 A forest in the city or a city in the forest? I once visited Plovdiv, in Bulgaria, and stayed B&B in a communist era housing complex. This was in the late 1990s, and maintenance wasn’t good. In between the blocks there were trees planted, and they hadn’t been pruned for at least a decade, towering above the 6-7 storey houses. The effect was surprisingly pleasing, with these really big trees really close in on the houses one could really start arguing if there was a forest in the city or a city in the forest. This entry was posted in City Planning. Bookmark the permalink.